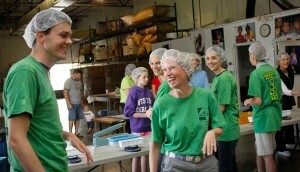 In Raleigh, N.C., they packaged more than 4,000 meals at Stop Hunger Now. In Palm Beach, Fla., they raised the roof at a Habitat for Humanity site build. In Winston-Salem they transplanted basil seedlings ready for their home in the Campus Garden. And at the Houston Food Bank they prepared 3,356 pounds of food to make meals for those in need. 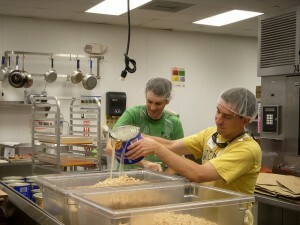 In Houston eight alumni helped the Food Bank prepare 2,797 meals. On June 1-4 more than 400 Wake Foresters representing 18 clubs donned hard hats and hairnets and gave back to their communities in the University’s first nationwide volunteer service event, Pro Humanitate Days. (See Flickr photo gallery). 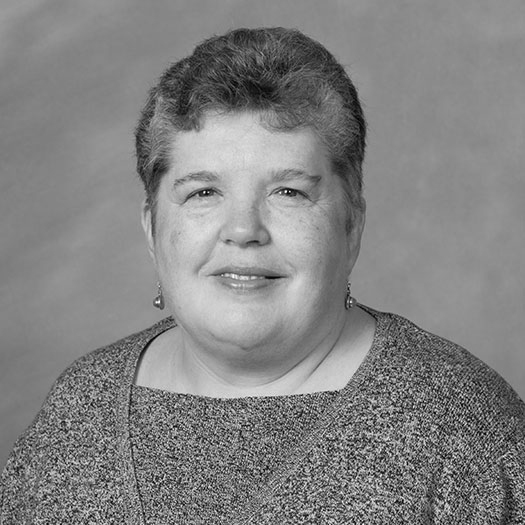 Also known as 4Good, the event was first envisioned by Alumni Council member Kim Boatwright Shirley (’85, P ’13) as an occasion for Wake Foresters to come together for the common good in the spirit of the institution’s motto. Los Angeles Deacs packed bags for homeless youth. David Bates (’84) of the Palm Beach, Fla., club said the spirit of Pro Humanitate united a group to help build a Habitat for Humanity house in Lake Worth. “When we arrived at the site, the only thing that existed was a concrete slab. Together, current students, alumni, families and friends helped construct walls of a building that will become a home to a needy family. Amazingly, the slab slowly transformed into a home as each wall segment was lifted into place. It was great to leave the site knowing that in such a short time, you can make a great impact on your local community,” he said. 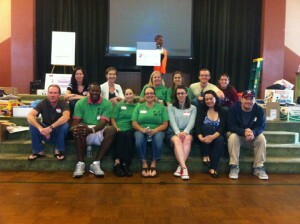 “It was a great morning of service,” said Shannon Bothwell (’98), president of the Palm Beach club. 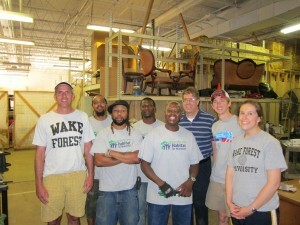 Demon Deacons in Richmond, Va., helped clean and organize the Habitat for Humanity ReStore. Eight members of the Richmond (Va.) Alumni Club cleaned and organized equipment storage rooms, swept and tidied up the aisles of the store, and assisted customers with loading their purchases of building materials into their vehicles at the Habitat for Humanity ReStore. In Atlanta Wake Foresters cleaned up Chastain Park and worked with Project Open Hand, preparing healthy meals for those in need. In Winston-Salem more than 50 alumni volunteers wrote letters to the troops and completed service projects for Wake Forest Campus Gardens, Wake Forest Campus Kitchen and SCAN (Stop Child Abuse Now) of North Carolina. Alumni Kim Boatwright Shirley (right) and Scott Bayzle (left) at the Raleigh 4Good event.